Tussar Silk is produced from silkworms. It is also known as Tusser, Tushar and Tussah and the sarees made from this particular silk is very popular in India. Its popularity is due to the gold sheen and has shorter fibres. It is the chosen material for saris and also punjabis for Indian men. The gold sheen makes it appear rich textured and also shimmering. Bulk production is Tussar silk is done in India out of which around 40% is from West Bengal. The tussar silk sarees produced in Bankura are famous for their kantha stitch which is a particular type of stitching process done by hand instead of machines. Kantha stitched silk sarees are quite expensive and exquisite. Tussar silk sarees are available in various beautiful colors. Tussar silk is also used to make punjabis for men and salwar suits for ladies. These traditional apparels also appear beautiful made from this silk. Producing Tussar silk is considered to be a cottage industry in Bankura where a large number of handlooms are found. This is a tradition of Bankura and thus the weavers still maintain the conventional handloom process to produce the silk sarees. Tussar Silk is also known by another name which is Kosa Silk. Tussar Silk clothes are exported to Gulf countries, to the USA and also various European countries. Maintaining tussar silk clothes takes a little caring. Dry washing the clothes is the safest option so that it retains its natural texture. You can also use cold water for clothes other than sarees to wash off the dirt. But remember to wash it with gentle hands since it’s delicate. Avoid using chemical bleach and never dry in directly under the sun. Silk needs to breathe and hence you must not store in inside paper. Fold it nicely and store it. Some of the most popular colors in tussar silk are magenta, red, turquoise, gold, dark teal, ultramine, chocolate and purple. The Bishnupur region in Bankura is famous for producing Baluchari sarees that are made from tussar silk with particular types distinct of patterns on them. Woven on Jacquard punch-card looms, the Baluchari sarees have pallus and borders with episodes from Mahabharata woven on them. 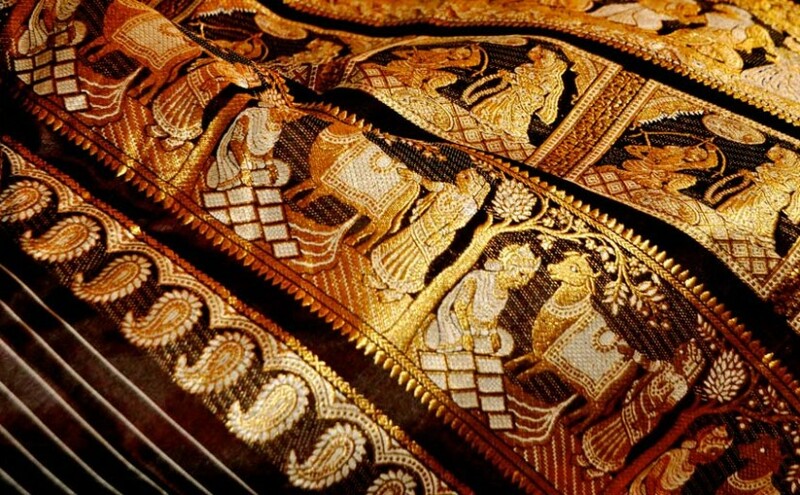 These exclusive sarees woven by the weavers are beautiful specimens of traditional art. However, making Baluchari sarees entail a lengthy process. 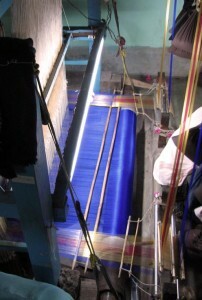 The silk strands are separately dyed and put in a loom after which punch cards hanging from the upper part of the loom are used to make the designs on the strands. The punch cards shave holes in them and are rectangular in shape with various designs on them. The dyed strands are made to pass through these holes and accumulate into precise forms on the loom making some of the most desirable sarees made from silk. This entry was posted by indispottravel in Art and Culture in West Bengal, West Bengal and tagged Art of Bengal, Art of India, artifacts are Bengal, Artifacts of Bankura, Artifacts of Murshidabad, Baluchari in Bankura, Baluchari sarees, Bankura Baluchari sarees, Bankura Silk, Bengal's traditional art, Bishnupur Balucharim how to make Baluchari sarees, Bishnupur Silk, Bulk production is Tussar silk, conventional handloom, Craft of India, Exclusive sarees, Exclusive Silk sarees, handloom, Handmade Artifacts of Bankura, Handmade Artifacts of Murshidabad, how to make Baluchari sarees, Indian traditional art, kantha stitch silk Sarees, Kosa Silk, Mahabharata in Silk Silk Sarees, Mahabharata is Sarees, Mahabharata woven, making of Baluchari sarees, Murshidabad Silk, silk, Silk exported to Gulf countries, Silk salwar suits for ladies, The tussar silk sarees, Tushar, Tussah, tussar silk, tussar silk colors, tussar silk colours, Tusser.